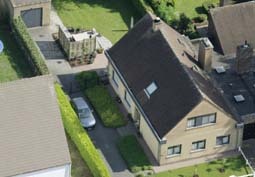 Our Bed & Breakfast is situated in a quiet quarter, near the centre of Bruges and at 4 kilometers from the market place (10 minutes by car or by bus). You can park free the car on the drive or in the street. The rooms "Framboos" and "Pistache" are two-bedded. It's possible to add another bed or baby cot. In our dining room, you can enjoy a continental breakfast. If the weather permits, the breakfast can be taken outside. In the lounge (next to the rooms), you can enjoy some tea or coffee, offered by the host. Free wireless internet can be used everywhere in the house. You get a free city map and we give you a lot of touristic information and suggestions.